Over the years, plenty of long-haired men have styled their hair into a man bun hairstyle. However, what is interesting, it is that it doesn’t resonate with any long hairstyle in men minds. Man bun hairstyle is very trendy nowadays and entirely a style in itself. For centuries, men have been using bun hairstyles, in the Roman Empire and Vikings times. The modern man bun hairstyle trend was started in 2013. It then fully took off in 2014, thanks to the hipster culture and the use of the man bun hairstyle by celebrities. It started in Brooklyn, New York and soon spread to US hipster-centric cities like San Francisco, Chicago and Seattle. Then, it started its virus-like spread across European cities like London, Berlin, Copenhagen and Vienna. By 2015, the man bun hairstyle had become a common sight in Asian cities like Tokyo, Osaka, Shanghai, Hong Kong and Mumbai. A man bun can be placed anywhere on the head – back, top and even front. The placement can vary an inch or two, but don’t place the bun too low on the head or too forward. The only obstacle is the length of your hair, which means that you need to commit some of your time to grow the hair for the type of mens hairstyles that you want to get. If you previously wore a mens short hairstyles, now you have to change your mindset and maybe clothing too. 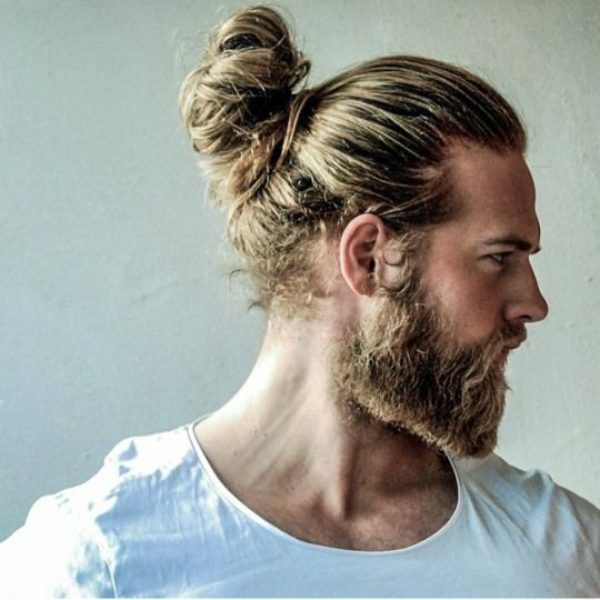 Without enough hair length, there’s no man bun hairstyle, so you must grow your hair as little as 6 inches in order to get at least a “semi bun”. The semi bun is also known as a topknot, and it is made up of only the hair on the top of the head tied into a single bun. It requires you to have 6-7 inches of hair length and undercut sides and back. You need 4 months to grow your hair to get your dream cool hairstyle – semi bun. A half bun is a half-finished bun with a tail hanging out of the bun, it is also known as a pony bun. The half bun is the best way to tie chin-length hair back when a full bun or semi bun isn’t an option. This is a very popular men’s haircut nowadays. You may like our post on the hottest haircuts for guys. It looks excellent with an undercut but works with longer hair. While it is often worn slick, the samurai man bun also looks great worn messy and product free. It can be an easy weekend style or juxtaposed with formal wear à la Jared Leto. The full bun uses all the hair on the head. In most cases, 9 inches of hair length is enough but we recommend to shoot for 10 inches. Ideally, the best hair length is between 12 to 16 inches. If you are crazy enough, you will eventually get one of the most trendy guys haircuts. How to tie a bun? Tying a bun is very simple and very easy to learn, you need elastic hair band and your hands. It will take you literally a couple of seconds to tie the bun once you have practiced the motion a couple of times. Once you have the end of the scooped hair established, you then choke the hair with the elastic band. Man bun hairstyles by nature are messy but relatively easy to keep up. You can use hairstyling waxes to give different textures to your bun or you can use different hairstyling creams to give different levels of shine to your bun. The sky is the limit. So go and get your stylish haircut! If you want to add a new style to your men’s long hairstyles, try the man bun hairstyles. Wear them messy or slick. Whatever you do, this rugged style looks great and keeps you comfortable.